Home to the President of the United States, sprinkled with monuments and filled with beautiful architecture dating back to the 1700s, Washington DC is a city like no other. Largely overshadowed by its role as the capital of the United States, Washington DC is a unique mix of being a working federal city, an international metropolis, a picturesque tourist destination, an unrivaled treasury of history and a cosmopolitan playground that somehow still retains its neighborly small-town ambience. In putting together this list, we aimed to pay each facet of this diverse city its due. Wondering how you can make your event fit seamlessly into your event strategy? Click the button below to download the Event Venue Guide. Why you attendees will love this venue: With 3 meeting rooms ranging from an open space to a more private and intimate setting, The Loft at 600F is a brilliant mix of modern tech and chic furnishing in a high-ceilinged historic building. The versatile space accommodates various layouts to meet your event’s needs in a homely atmosphere. The National Union Building has 6 floors of dedicated event space. With meeting room capacities ranging from 75 - 850, a dedicated team of event experts at your disposal and state of the art tech & furnishings all packed into a historic building from 1890, you can be sure of a high attendee satisfaction level. Why you attendees will love this venue: Ranging from a boardroom to conference centers and a roof terrace event space for you to choose from, the 20 F Street NW Conference Center is a modern meeting and conference facility on Capitol Hill. Host a rooftop event with a beautiful view over the Washington Monument and the Capitol Dome. Why you attendees will love this venue: The Dacha Loft is the private events venue of the Dacha Beer Garden. With its original wood floors, 30 ft. ceilings, three bay windows and exposed red brick walls to set the ambience of your event, this unique event space will set the tone for an unforgettable event experience like no other. Not to mention, close proximity to beer and food. Why your attendees will love this venue: If you’re looking for a venue that’s outside of this D.C. city limits, the National Conference Center might be for you.As the name suggests, it has been a leader in learning environments for more than three decades. The event space has been carefully constructed to conduct the most effective meetings, training events and social gatherings for your organization. With 265,000 square feet of event venues with 250 meeting rooms, over 900 guest rooms and a rope course for team building activities, it seems difficult to disappoint. Why your attendees will love this venue: The Andrew Mellon Auditorium is undoubtedly amongst the very finest classical buildings in America. Designed and built in the 1930s, the auditorium retains its classical architecture on both its exterior as well as interior. Located two blocks away from the President’s Park, this event venue boasts6 event spaces. Why your attendees will love this venue: In 2011, the new rooftop design of the building began with the main purpose of offering the most spectacular views of the Nation’s Capital. With a stunning view panning from Union Station to the Library of Congress, the Capitol Dome and Washington Monument, this is an event space not to be overlooked. Additionally, having installed 2,100 sq. feet of retractable awning and contingencies for bad weather always in place, this space is viable for any events at any time of the year. Why your attendees will love this venue: Nobody ever said events had to remain on land. If you want to create a unique event experience, then maybe chartering a cruise for your attendees might just be the way to go. With a fleet of ships to choose from and the flexibility of planning your event needs and cruise routes, Entertainment Cruises might be the missing piece to your event planning puzzle. Choose from 5 different cruise ships ranging from 80 to 600 capacity to suit your event needs. Why your attendees will love this venue: Although the hotel boasts a total of 10 event spaces and meeting venues, the one which really catches your attention will be their amazingly furnished rooftop, fittingly named The Rooftop at Dupont Circle. Enjoy plenty of fresh air and breathtaking views in the pool, under the cabana, or just lounging in one of the deck chairs. The rooftop venue is beautifully decorated with colourful furnitures and can cater to a reception of 200 attendees for your next event. Why your attendees will love this venue: Step into the beautifully restored, historic firehouse dating back to the 1890s. It is now refurbished to serve your event planning needs.With 8,000 sq. ft of space, 3 floors of event spaces and a patio to boot, Engine Company 12 might make your party the hottest talk of the town. Why your attendees will love this venue: Often referred to as the American Louvre, the Renwick Gallery is an event space of the Smithsonian American Art Museum. Located just steps from the White House, this stunning Smithsonian museum and National Historic Landmark is the epitome of sophisticated elegance. The 4,000 square feet of event space is perfect for an intimate dinner or magnificent cocktail reception to impress your guests. Why your attendees will love this venue: The Penthouse Pool Club has two facilities, one on U Street and the other in the Navy Yard. This exclusive members-only club serves as a private events venue for rental. With its rooftop pool and lounge setup, the club is a fantastic outdoor venue to consider on the weeknights of spring and summer. In addition to its food and beverage offerings, the club is open to external sponsors as well to hype your event up. Why your attendees will love this venue: The Newseum is widely acclaimed as one of the most interactive museums in the world. With galleries focused on increasing the public importance of free press and the first amendment, there’s definitely something for every visitor that walks through its doors. You can rent out a couple of private event spaces or even the entire museum. Additionally, the Newseum partners with Wolfgang Puck’s world-famous cuisine to cater world class food for your world-class event. Why your attendees will love this venue: No, this church is not only available for events related to its faith. Its mission is to welcome people of all age, race, faith, gender and sexual backgrounds to build communities amongst the diverse population in the metropolitan city. Their facility has been specially designed without embedding permanent religious symbols to allow secular events or events of other faith groups to have an event space of welcome and affirmation. Why your attendees will love this venue: This boutique urban winery has numerous event spaces and meeting rooms with floor to ceiling windows overlooking the Anacostia River. What better way to host an event than tasting wine that’s crafted on-site along with exquisite cuisine from the restaurant with a beautiful winery in the backdrop? Why your attendees will love this venue: Housing the Embassy of Sweden and the Embassy of Iceland, the House of Sweden is an exemplary example of contemporary Scandinavian architecture designed to physically represent the Swedish values of openness, transparency and democracy. 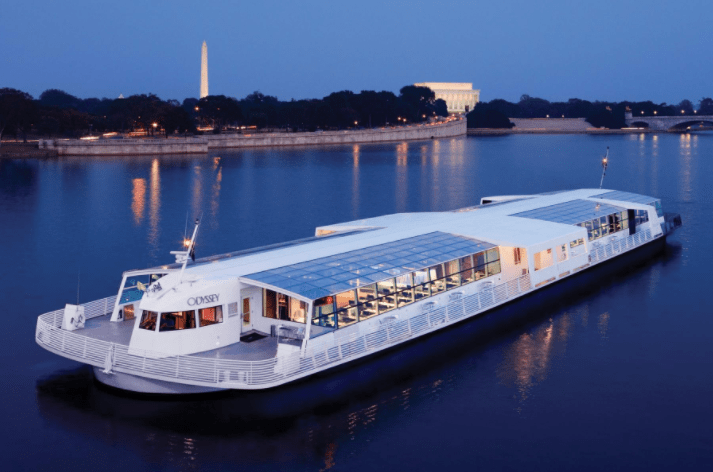 Host your events in the only venue in Washington DC with panoramic views of the Potomac River, Kennedy Center, Air Force Memorial and the Watergate Complex. With 12,000 sq. ft. of meeting space to choose from, this venue is sure to impress your attendees one way or another. Why your attendees will love this venue: Home to the Washington Nationals, this MLB Stadium is available for private events all year round on non-game days. Let your guests get exclusive access to the field, clubhouse and dugouts. The stadium also offers unique experiences like batting practices or special appearances by their very own mascot. From family-friendly outings to high-end receptions, the Nationals Park is event space definitely shines bright like a diamond in the city. Why your attendees will love this venue: Known for its Tony-Award winning productions, the Mead Center offers a unique blend of breathtaking views, stunning architecture, theatrical history and world-class hospitality. Every aspect of the building was designed to accentuate nothing short of the best ambience for any event hosted on its grounds. From intimate pre-theater dinners to spectacular galas and conferences, the Mead Center definitely will not disappoint with its dramatic setting and services. Why your attendees will love this venue: As a Masterpiece of Modernist Architecture, The Kreeger Museum is a unique and coveted venue. The building offers a monet-filled great hall, modernist gallery, sculpture terrace and expansive contemporary sculpture garden surrounded by woods. The entire location is replete with modern and contemporary art both inside and out. We curated this selection of event venues to offer a wide variety of space, design and functionality to accommodate your event vision. Choosing an event venue is no easy task; it sets the tone for the rest of your event. To get the most out of whatever venue you decide on, plan accordingly and fully utilize the services provided by each venue to its fullest potential. Besides your event venue, there are many other aspects to planning the best event you can. Click the button below to access a comprehensive guide for connecting the dots of your event strategy.